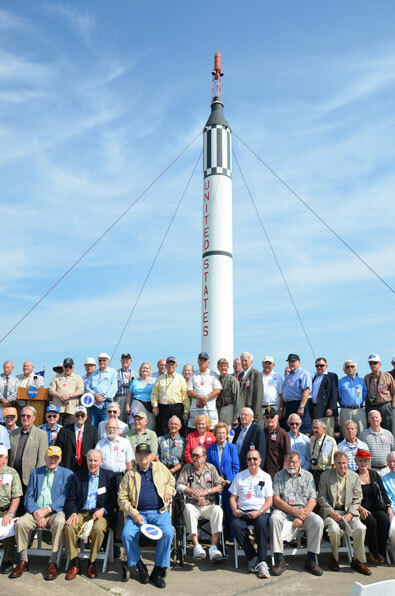 — NASA commemorated today the 50th anniversary of the first U.S. manned space flight with a time-synchronized multimedia replay of the 15-minute suborbital mission at the same Cape Canaveral launch pad that was used by the late astronaut Alan B. Shepard Jr. on May 5, 1961. 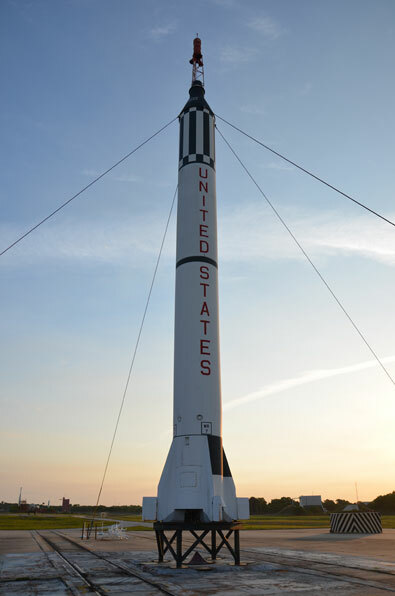 The audio-and-video presentation, which was shown on a Jumbotron situated near an 80-foot replica of Shepard's launch vehicle, was timed so it would coincide with Mercury-Redstone 3's mission milestones, in particular the exact moment of liftoff and splashdown — 9:34 a.m. and 9:49 a.m. EDT, respectively. 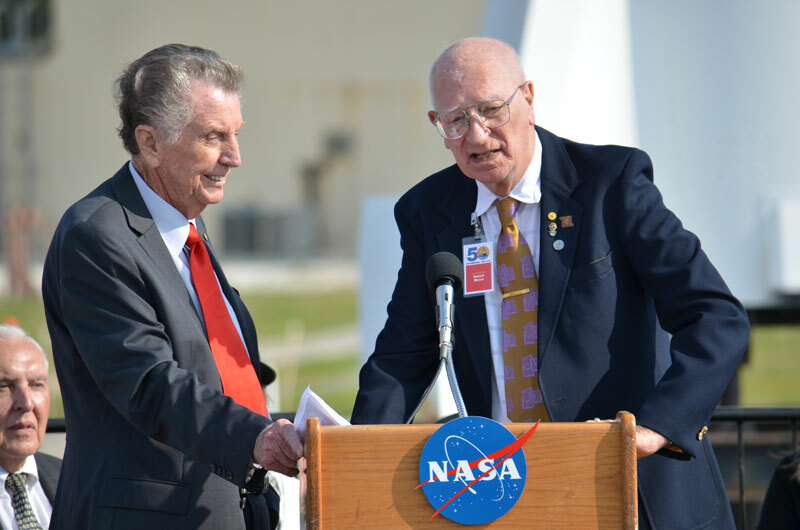 The ceremony honored the NASA and contractor workers who made the Mercury Project possible and the influence that the success of the program has had on the country. 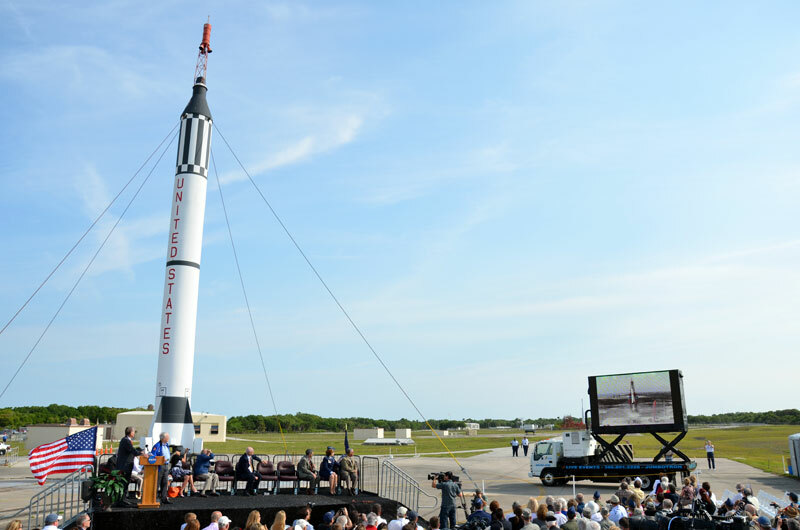 A Jumbotron set up at Cape Canaveral Air Force Station's Launch Complex-5 plays back the launch of Alan Shepard, America's first astronaut in space, aboard Mercury-Redstone 3. The audio and video was timed to coincide with the events 50 years ago. 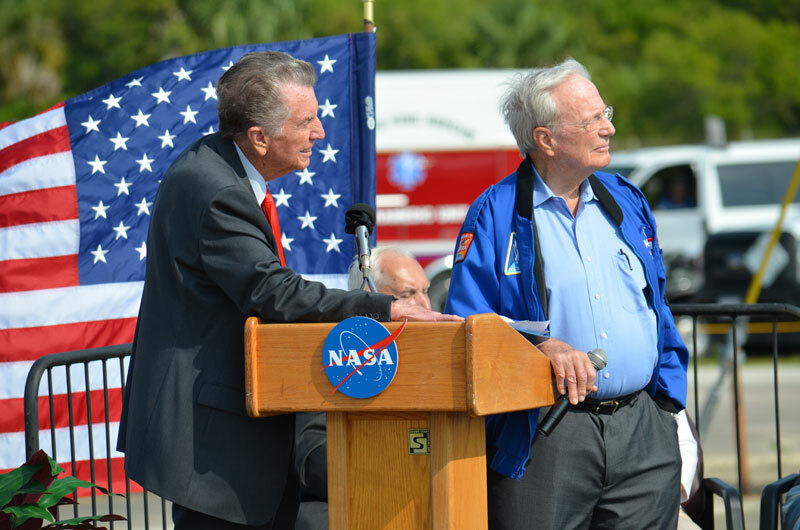 Veteran NBC journalist Jay Barbree (left), the only reporter to witness all U.S. manned launches, and Original Mercury 7 astronaut Scott Carpenter watch the replay of Alan Shepard's launch. 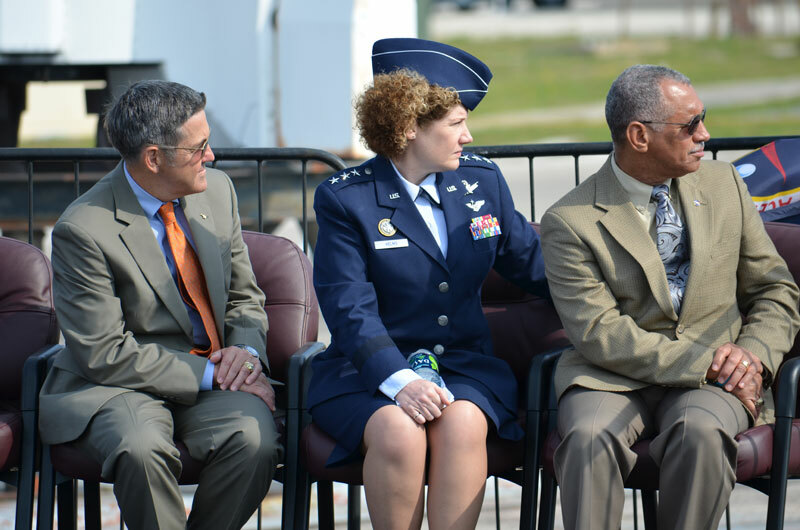 Kennedy Space Center director Bob Cabana, Lieutenant General Susan Helms, former commander of the 45th Space Wing, and NASA Administrator Charles Bolden — all three former astronauts — watch the replay of Shepard's 1961 flight. 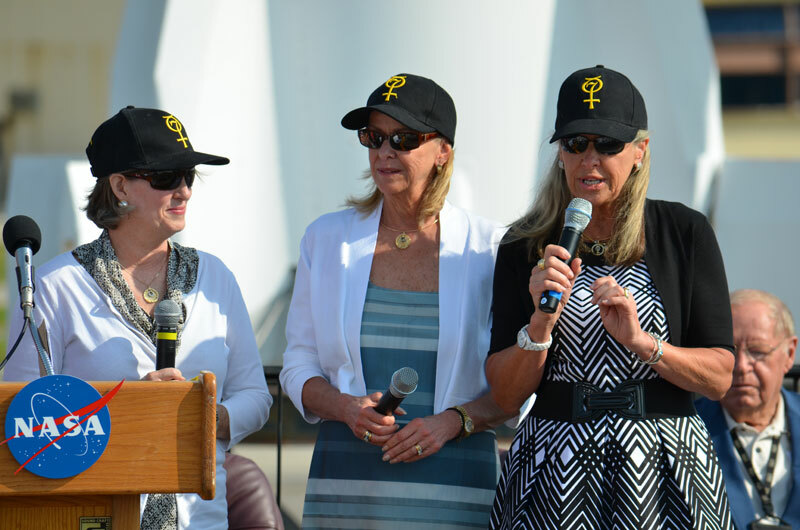 "I remember every time he spoke, he always gave credit to everyone in NASA who built the good ships that brought him home to us safely," said Shepard’s daughter Laura Churchley, who spoke alongside her sisters Alice Wackermann and Julie Jenkins. 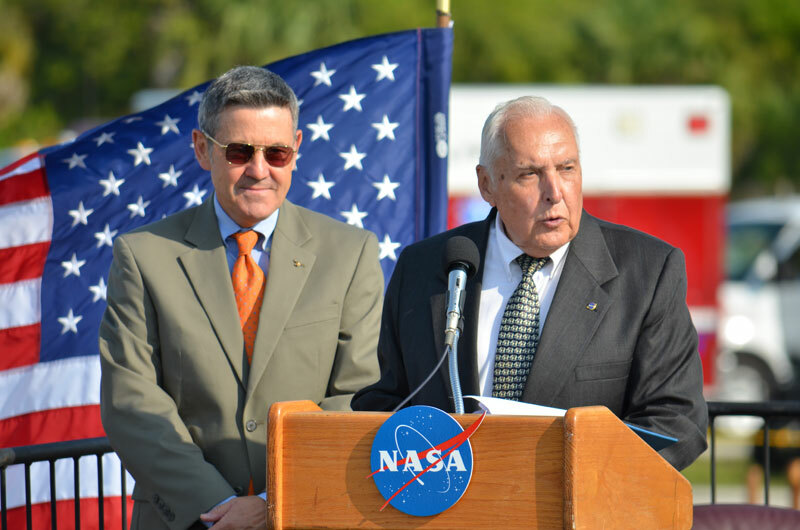 Master of Ceremonies for today's ceremony Hugh Harris, former director of public affairs at Kennedy Space Center, with Cabana. "It was an intense countdown. Everybody had their job. There was no joking around," said former chief test conductor Bob Moser, seen here with Barbree. "But we enjoyed it, and it worked. Congratulations to all of us. We were a great team." 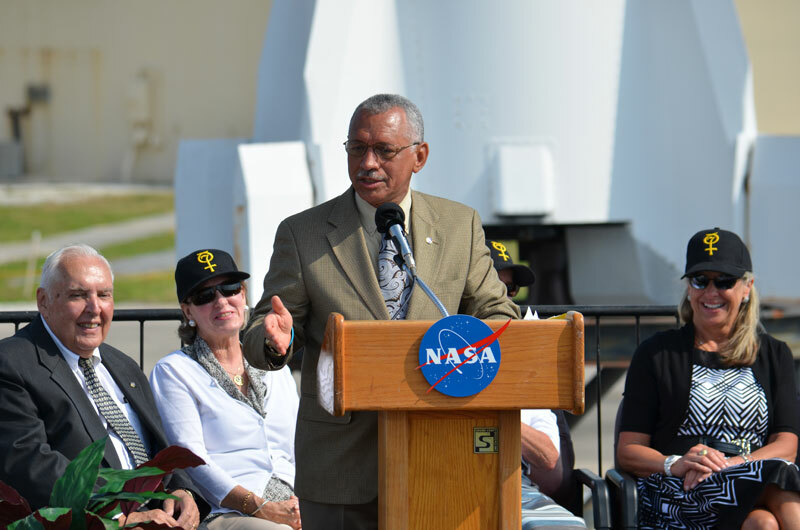 "It's an honor to share this day with so many people who helped NASA pioneer human spaceflight and enable the agency's many accomplishments throughout our existence," Bolden said. "I salute all of you." 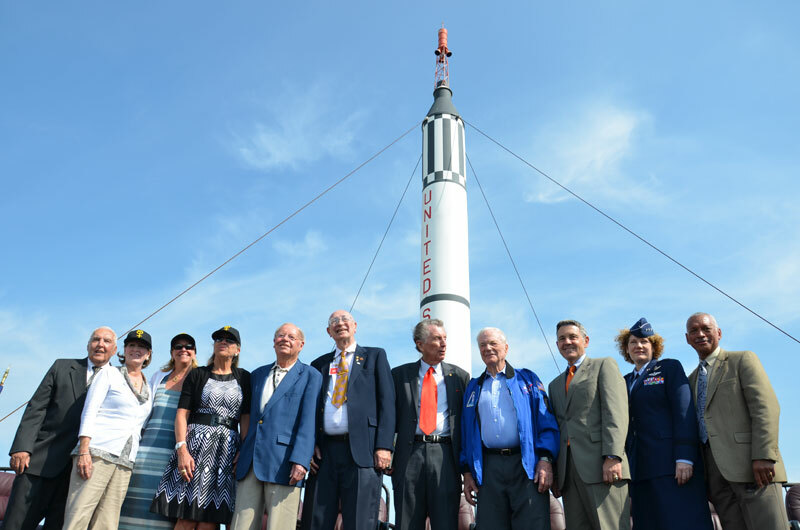 From left to right: Former Director of Public Affairs Hugh Harris; Alan Shepard's daughters Alice Wackermann, Julie Jenkins and Laura Churchley; Former Chief Public Information Officer Jack King; Former Chief Test Conductor Bob Moser; Veteran journalist Jay Barbree; Mercury astronaut Scott Carpenter; Kennedy Space Center director Bob Cabana, Lieutenant General Susan Helms, 14th Air Force; and NASA Admininstrator Charles Bolden. 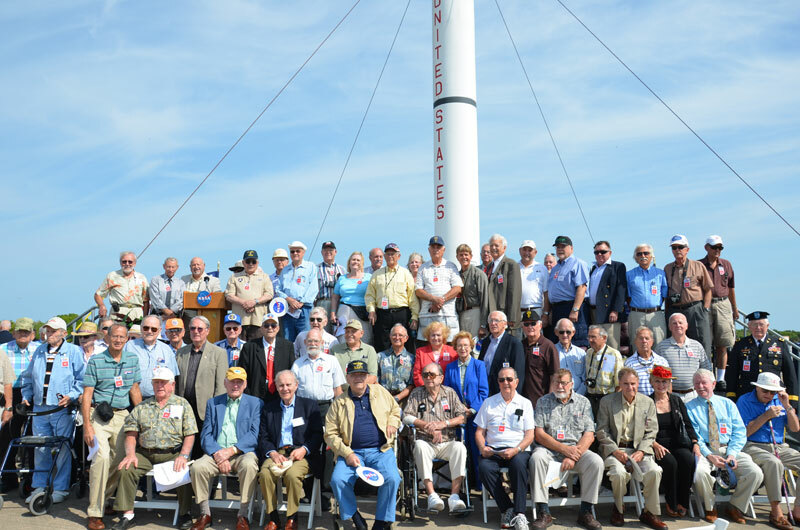 More than 100 former workers from the Mercury era were in attendance at the Mercury-Redstone 3 50th anniversary ceremony.